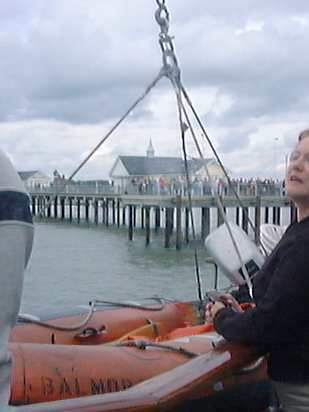 On 22 June 2002 the Balmoral gave the first direct steamer sailing from Southwold to London since 1924. 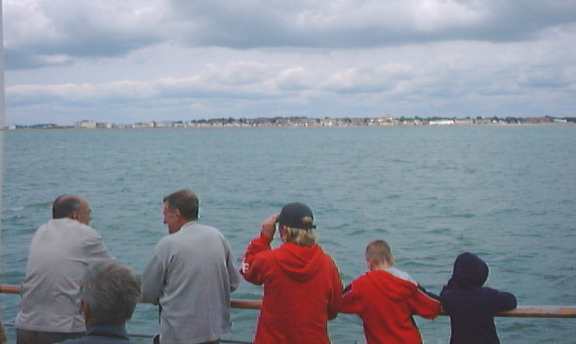 Although there were later sailings, these involved a change of steamer at Clacton. 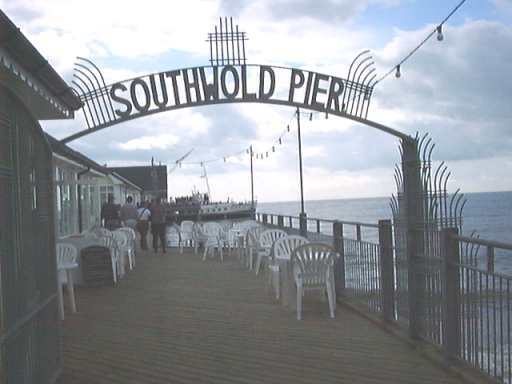 We bade farewell to the new pier. 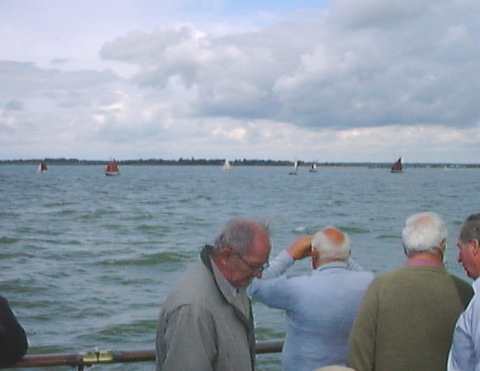 The re-opening co-incided with the Southwold Classic Boat Rally. Here some traditional fishing are sailing out of Southwold Harbour (about a mile south of the pier) to sail to Lowestoft. Soon we were passing the town of Aldeburgh, famous for its music festival. 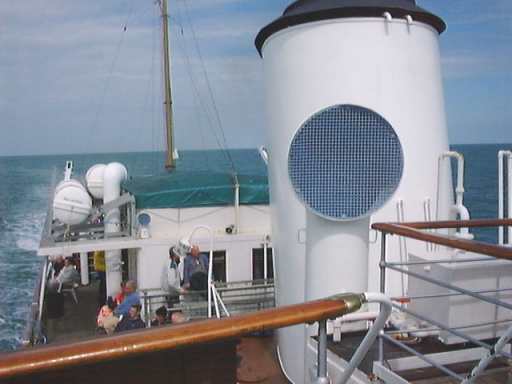 Again the sun shone brightly during the sea passage. 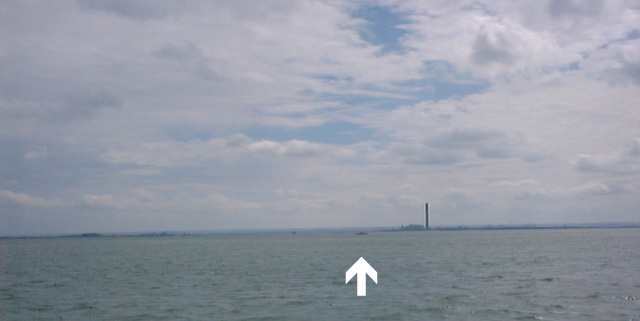 Passing Southend we had a very distant view of Paddle Steamer Kingswear Castle (arrowed) crossing the mouth of the River Medway, with Grain Power Station chimney on the west bank. 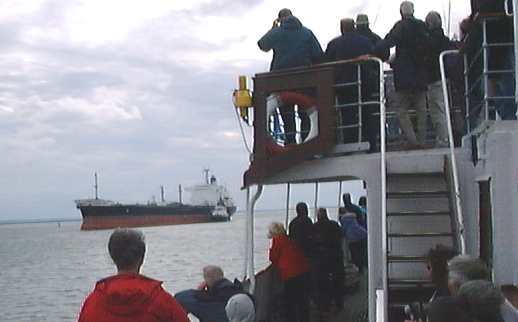 Approaching Coryton Oil Refinery, we were held by Port Control while the tanker Kriti Art manoeuvred off her berth and headed out to sea, assisted by tug Sun Mercia. 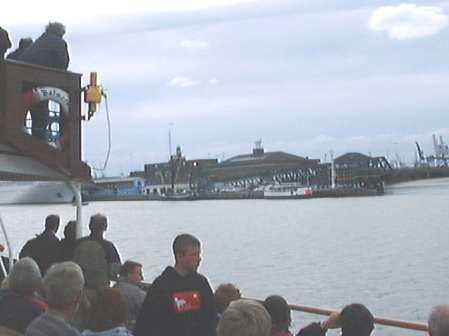 At Tilbury Landing Stage the "new" Gravesend ferry, Duchess M (with the orange panel on her stern), was alongside with the sailing barge Thistle. Silver Shadow was berthed at the International Cruise Terminal. 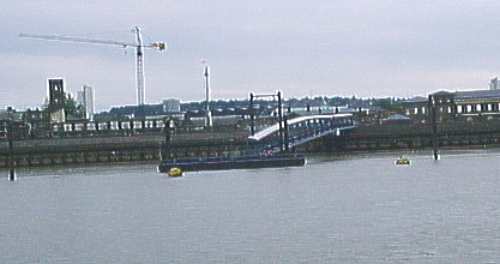 The new pier at Woolwich. Unfortunately the yellow emergency mooring buoys will preclude a call by the Waverley, although the Balmoral was due to call the following day. The former Mersy Ferry Royal Iris high and dry just downstream of the Thames Barrier. Above Greenwich we encountered the fake paddle steamer Elizabethan. 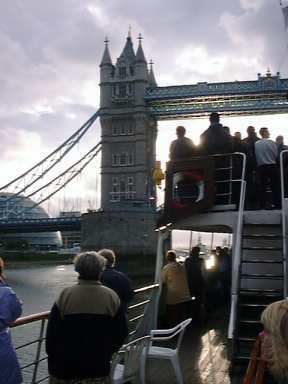 And finally through Tower Bridge, on time after seven and a half hours.